W.J. Reynolds - Ford & Fordson dealer in the 1930s. Homepage. This page: Papers that relate to a garage/car dealership that sold new Fords in the 1930s. W.J. Reynolds - Ford & Fordson distributors. Four items of paperwork shed light on the W.J. 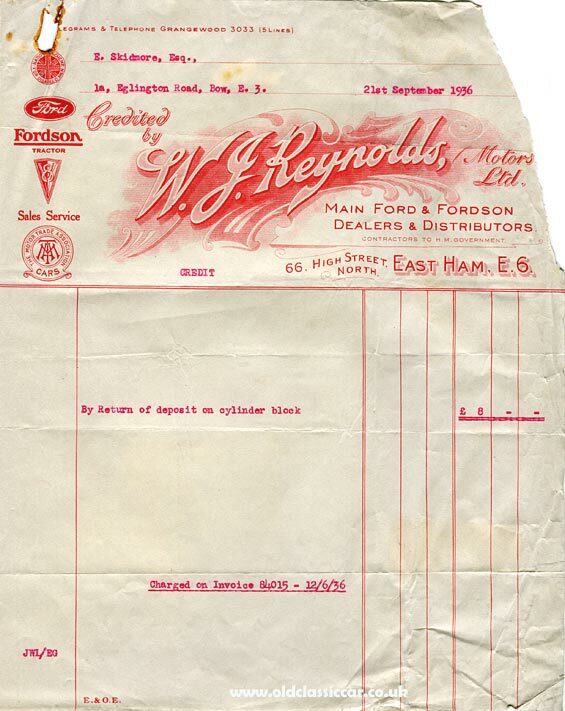 Reynolds dealership that was based in East Ham, a suburb of London, in the 1930s. 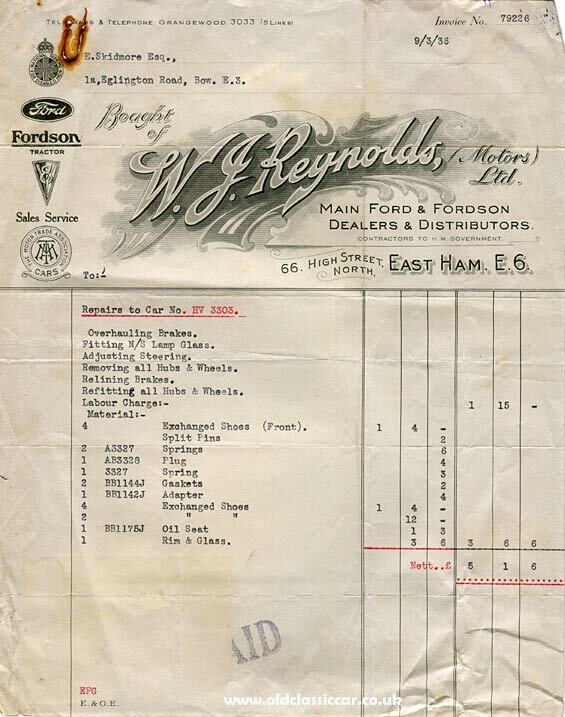 The papers document work done to vehicle(s) owned by a Mr E. Skidmore, of 1 Eglington Road, Bow, also in the capital. The illustrated headings give a few clues as to the size of this garage/dealership, and also the cars in which they mainly dealt. 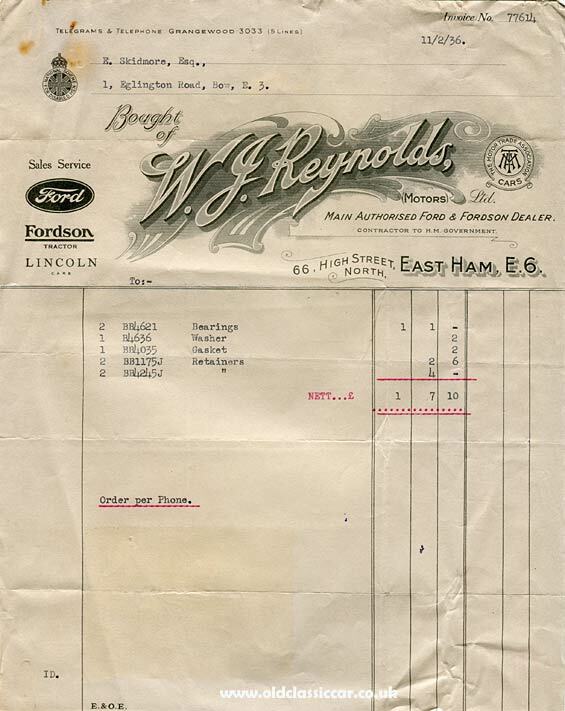 The invoice dated 11th February 1936 refers to the sale and service of new Ford and Lincoln cars, and also Fordson tractors. The firm was a member of The Motor Trade Association, and the National Scheme for Disabled Men. The latter scheme came into being shortly after the Great War, where incentives encouraged businesses to employ former servicemen who'd been injured while serving for their country. The invoiced items in the first invoice were a number of small engine components, although the vehicle to which they applied isn't mentioned. The garage was located at 66 High Street North, in East Ham E6. The building survives, but is now a discount shop rather than a motor-related establishment. The second invoice is dated 9th March 1936 and the company's invoice header has altered slightly. The reference to Lincoln Cars has disappeared, while the logo for the Ford V8 has been added. References to Ford and Fordson have also been enlarged. Extensive repairs carried out on Mr Skidmore's car are described in full, these included overhauling the brakes and steering, and fitting a new headlamp glass. The car's registration is given - HV 3303, a London series that ran for a relatively long period of time - June 1930 to July 1938. A monthly statement, dated both 1st August and 1st September 1936, advises Mr Skidmore of his account with the dealer. 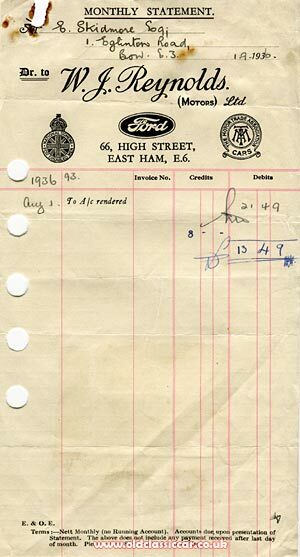 Last in this small collection of papers is a credit note, relating to a deposit made for an engine cylinder block. More period items relating to cars and garages can be found in the Motoring Collectables section of the site. These include another item of ephemera relating to Mr Skidmore, namely correspondence he had with Henry Simon Ltd, the company behind Tyresoles re-treaded tyres. This can be found on the Tyresoles Ltd page. Other items in this section of the site also include an item of paperwork issued by a different Ford garage, in 1933, link here.